Star of Chamblie – 9 Blocks Completed!!! Again, Happy Easter to all! May we all remember why we celebrate this day each year! I have finished all 9 blocks for Star of Chamblie! I have enjoyed the process and the challenge in making them. I will, of course, be changing the sashings from the little Stars that are in the original quilt pattern. I am just not in the mood for any more challenges with this quilt! There was one quadrant that gave me fits on all of the blocks, so there was something amiss but I could not and did not want to dissect the pattern any further! When you make a highly technical block such as a Feathered Star and only have 1% problems with one little section, that is called HAPPINESS! 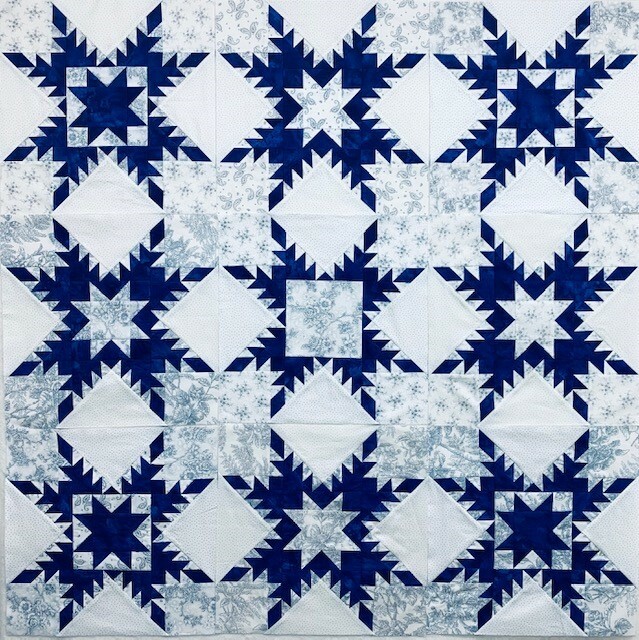 I will be using the blue for the 2″ sashings (no stars) and a 2″ blue border around the blocks which will allow me to change fabrics without disrupting the background fabrics used in the Feathered Stars. If I had been able to make this quilt when I purchased the fabrics, I would not have been so limited on the fabrics, as I would have been able to order more. So there was a fabric challenge along with the difficult technique in making the blocks. I was blessed to find 4 more fat quarters of the fabric on eBay – which saved the day! I will say, that I am very VERY relieved that I am to this point in making this quilt! Next I will make 176 each, 2 1/2″ HST’s for the Sawtooth border using the Bias Strip Piecing for HST’s method. This method provides perfect HSTs with the bias on the inside and straight of grain on the outside! So I present 9 Blocks for Star of Chamblie Blocks! I chose to place a plain square in the middle star, with 4 Dark Blue Stars on each corner and 4 Light fabric in the alternating blocks. The blocks will not be touching when I finish with the sashings. I have selected the fabrics for the sashings and if it works out I have some beautiful fabric for one more border before I add the Sawtooth (HST’S) Border. Next step is to make the HSTs, add sashings, add another fabric border, and then the Sawtooth Border. I am still hoping for a finish before May gets here! Tomorrow is house cleaning day for me, as I have put it off until all blocks were finished. If you ever decided to make a feathered star quilt I recommend that you start and do not take a break in the process. I did take a break and I see where a break in making such a complex block is not advisable. I had all the remaining blocks cut out, but when you leave a project like this for 2 weeks the rhythm is gone. Have a wonderful week – and enjoy stitiching! Hello from a beautiful Spring day in South Texas! It appears that cutting the Parallelogram correctly at 1 and 9/16″ worked!!! This is Block 6 of 9. Now that I have a little (?) problem area corrected the sewing goes faster. And 2 more Dresdens completed. Have a great Tax Day! We are now half way through the month of April!!! Before we know it Christmas will be here! The time seems to speed up once we switch to DST – I always complain about losing that hour forever! LOL On the weather (have to have something to complain about) winds were over 15 to 25 MPH every day for the last 4 days and each day they came from a different direction! Hope this quick change weather is over with! On the positive side of life, as I was walking on Thursday morning I looked up and saw the prettiest clouds and though I would share a picture with you. I have 4 more blocks to make to finish Star of Chamblie! I started Thursday afternoon and was halfway finished. So here is were I was on the block Thursday evening! Then Friday afternoon I attempted to finish it and here is how that effort ended up! Oh darn, it is in the trash can! A typical Nanette mess! I really messed screwed this one up! But, alas, it was not in vane, as I was cutting out a replacement block, I discovered why I was having issues with the Parallelogram star points! I should have been making the cut at 1 and 19/16″ and I THINK I may have been cutting them at 1 and 1/2″. Today will confirm what I think is the issue as I sew the new block. I also quickly re-cut the other Parallelograms for the other 3 blocks to prevent further issues. I made other errors (like sewing some seams with a scant and some with the full 1/4″ seam allowance, which of course is a big NO NO!). For some reason I left my mind elsewhere this last week! LOL I had a feeling that leaving this project in the middle to take a little getaway would cause me a problem, but there was a reason in doing so. I was able to take a fresh look at a minor major problem that needed to be corrected! In case you would love to make a Feathered Star by Marsha McCloskey, I highly recommend that you purchase her Feathered Star Ruler! It will keep you sane! Another ruler that Jan told me about last night is the Creative Grid Itty Bitty Rulers. I ordered a couple from Amazon last night! These rulers are in 1/8″ markings! On the finishing side of things, I did finish my Dish Rag and with no errors! Yea! I had problems with this pattern, but now I know where to be careful when coming to an area of the pattern that has been causing ‘operator’ error! Today will be a beautiful day in South Texas – my kind of temperatures in the morning – 47 degrees! It may be the last of the cool mornings! Who knows. I am doing very well in my adventures with Mr Diabetes! I have found that after supper if I ride the stationary bike and vacuum the house that the glucose levels drop like a rock! UNBELIEVABLE. I really had gotten into the habit of just sitting in my chair after supper! After moving around from 6AM until 6PM including a mile and a half walk, one would think that is enough, but it appears that some movement after eating lowers the glucose levels! Mine are in the normal range now! I am hoping that in July when I do another A1C that I am below pre-diabetics. Here is hoping that this next week is peaceful and quiet (only one trip to SA on Wednesday) and that my brain stays with me and not asleep and I can finish Star of Chamblie blocks, and maybe even finish the flimsy! It would make me happy! Have a great week all and thank you for stopping by for as the world turns in La La Land! Today is our HQAL show and tell. Please take the time to check out the great quilters who are participating in showing their hand work! Greetings – now we are in the throws of summer for the day – a wonderful 95 degrees for today – then a change tomorrow. I am loving this roller coaster ride! I am getting back in the groove of sewing and working on my projects and daily routine of our retirement life is absolutely wonderful! I guess I have finally decided that home is the best place to be and take a day trip to get away! At least this is where I am now. Once summer really hits all long distance travel is off the list – just too hot! OK now on to where I am in catching up Susan’s SAL! I have all of the Mini Dresden’s completed and last week we were to do the Spools! I cut out all of the 23 blocks (not difficult at all) and yesterday I completed the Red Spools. Today I will complete the remaining 13 blocks and be caught up for 2 weeks. This will make time for Star of Chamblie! I purchased another pattern that I want to make (OK – I am dreaming I understand), but it is so much fun to look forward to making new and different quilts. Some difficult, some just for fun, and some to drive me absolute nuttier than I already am! I happen to see Monterrey Medallions on a blog post and just could not pass it up. I love Atkinson Designs Monterrey Medallions. Just could not let it go so I ordered it from Amazon! Well, this is all I have to show for my few days of ‘sewing’ there would be more, but…..
UPDATE: I have finished all the Spools – Green and Gold make 23 for this project! Have a great day and rest of your week and enjoy sewing and quilting, I know I am loving being back into my routine! Check out the HQAL Group of Participants this weekend. Happy Sunday to all! We are getting rain. 2 inches so far and the Thunderstorms are not over. I am hoping for 5 inches! We have not had rain all winter so this is a blessing. The negative…Menieres and Vertigo but small price to pay for the blessing of rain. Upon arriving home from Kinder last week nothing went the way I had planned! That is the price we pay for having fun! We came home with majority of our $$$$ so we decided to upgrade our Apple watches to the Series 4. They are 2mm larger than the Series 2 and really make a difference. Money well spent! I am participating in the A Merry Christmas To You SAL with Suzan Quilts. I have finished the 4 embroidery blocks. I was behind everyone due to our trip but now I am getting caught up and hopefully ahead of the game before Wednesday. There were 18 Mini Dresden Plates and I finished mine yesterday. Next step is to hand applique on the background block and I will do that in the evening. Today I will be working on 23 “Spool”blocks as I want to get ahead of things so I can get back to finishing the last 4 Star blocks for Star of Chamblie. I am almost through with another knitted Dish Rag. For some reason I tend to get off track with this pattern each time. I do believe I see how I make that mistake! Maybe I have finally mastered the pattern. Next on the happenings here are the two great books I finally received from Quiltmania. I would love to make every quilt in the two books. The are so pretty! Along with the above books I happened upon a Blogger who was making Nancy Rinks Getting to Know Hue! It was a 2016-2017 BOM. I did not want to participate because at that time one had to purchase fabric kits and I do not do kits. This is a great way to play with colors. I purchased it from Amazon. This is another beauty that I want to make! It is great to be home and back into a quiet routine. I have now lost 25 pounds. Working to lose weight and manage Diabetes is tricky and very difficult with my food choices but I keep on trying. I do know that too many potatoes and any fruit can play havoc with Glucose levels! Have a wonderful week and happy sewing! We are home from our Mini Outing To Kinder Louisiana Casino! We arrived home on Thursday. We had a wonderful trip and did not lose the homestead in the Casino! It feels good to be home and back in a routine! Here are some pictures of the Chalet and area where we stayed. Her is a picture of the Navigator parked in Chalet Number 6! All the comforts of home with a few exceptions. The shower was for short people and when we sat on the couch we sunk to the floor! LOL 😂 Clay is 5’11” and I am 5’8″. We sailed through Houston without stopping at all. This afternoon while sewing I looked up to see the fattest Squirrel sitting in our bird feeder. I just had to take a picture of this! Our bird feeder is a pole with a cookie sheet and a metal lamp shade that usually keeps the Squirrels 🐿 out of it! But not today! In addition while we were away our trees bloomed. I was so happy to see all the pretty green. If we do not get rain we will lose more trees this summer. Have a great weekend and watch out for April Fools Day! HQAL FOR 24 March 2019! I have finished all 9 blocks for A Bountiful Life! Now on to the Border, which may take another month to do that! The background is not quite this dark! This is the last block that I finished this week! Have a great week – we are on the way to Kinder to enjoy a week of Casino time and time to get away from Cabin Fever! Have a great week! Please check out the other participants in the HQAL and enjoy their projects.